There are dozens of engineering entrance exams. It is important to decide now which ones to appear in to study engineering in 2018. One can appear in only those exams which one has applied for. Students have several questions surrounding important engineering entrance exams 2018 such as “What are all of the engineering entrance exams?”, “Which engineering entrance exams should I appear for in 2018?”. 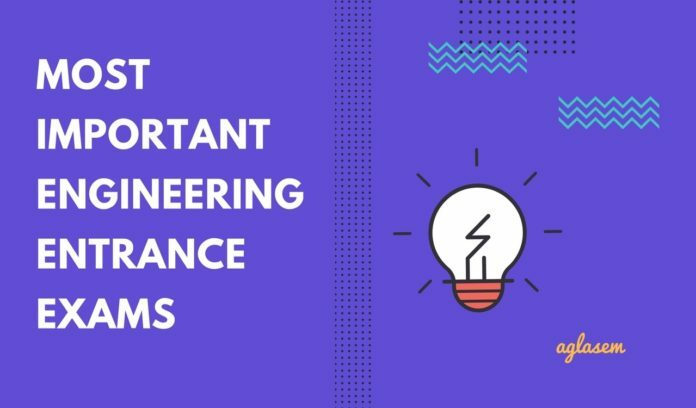 To answer those and similar questions you may have in your mind, here is a list of 10+ most important engineering entrance exams to study engineering in 2018. These are the ones which are important and also their application forms have been released. Mentioned below are those exams which are important, but their application forms will be released in some time. The following exams are also super-important, but you may want to appear in only one of them as they are state level exams and you will be most benefitted by the one that is for your state. You should appear in these five exams. It was decided by MHRD four years ago that there will be a two tier examination. JEE Main is conducted by CBSE. Rank obtained in JEE Main forms the basis for admission to National Institutes of Technology, Indian Institute of Information Technology, Centrally Funded Technical Institutes, several more. NITs, IIITs, CFTIs take part in centralized counselling offering more than 25,000 seats. This makes JEE Main the most important engineering entrance exam. JEE Advanced is the second tier (in a manner of speaking), since only the top 2.4 lakh performers of JEE Main can appear in it. Number of seats in all IITs that get filled through centralized counselling are more than 10,000. Since the most reputed engineering institutes in India are IITs, NITs, IIITs, CFTIs and since around 36,208 seats are offered through these two exams, therefore JEE Main and JEE Advanced are really important. As per ranking of Outlook India, Birla Institute of Technology and Science, Pilani is fifth best engineering college. BITSAT is entrance exam for admission to BITS Pilani, Goa, Hyderabad campuses. Number of seats is around 2000. Since Pilani campus enjoys best ranking of the three campuses, cut offs are quite high for it. However, all campuses have equally good learning opportunities for engineers. A state level engineering entrance exam opens up a road for you to engineering colleges in state. This includes government colleges in that state. There are nearly sixteen state level engineering entrance exams in India. You should definitely appear in that exam which is conducted by your state. In some states, such as Karnataka, there may be more than one exam for a group of colleges. This list should be helpful. As the name suggests, here we are referring to an engineering entrance exam organized solely for one university. For example, GGSIPU conducts IPU CET, Aligarh Muslim University conducts AMUEEE, Cochin University of Science and Technology conducts CUSAT CAT. Most universities accept state level entrance exam or national level entrance exam scores. So if you have any particular university in mind, which you seek admission in, look up its admission process. Appear in university-level engineering entrance exam then. The longest list of engineering entrance exams falls under this category. They are open for students from all over India (no domicile needed). You can choose to appear in any one of these, depending upon factors discussed below. Here we will elaborate on the final point in above list. VITEEE: VIT Vellore conducts VITEEE. Through it, admission is offered to VIT Vellore Campus, Chennai Campus, VIT-Bhopal and VIT-AP. 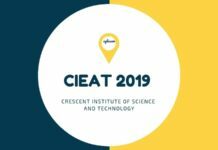 Manipal OET: Manipal Academy of Higher Education conducts Manipal OET. Manipal Institute of Technology (offering engineering programs) is situated in Karnataka. SRMJEEE: SRM Institute of Science and Technology conducts SRMJEEE. Its campuses are in Chennai, AP – Amaravati, Delhi – NCR – Sonepat. AEEE: Amrita Vishwa Vidyapeetham organizes AEEE. It offers eight programs in B.Tech. KIITEE: Kalinga Institute of Industrial Technology conducts KIITEE. A huge plus for students is that there is no exam fee. GAT: GITAM conducts GITAM Admission Test for engineering admissions. Candidates aspiring to study architecture and pharmacy can also apply. How to decide which engineering entrance exams to appear for? Ranking of college: You can check NIRF rankings, Outlook India ranking, Times Higher Education ranking. Usually ranking information is available on website of the college also. Location (state) of college: You may have already made up your mind on which state you wish to go or do not wish to go for college. Sometimes some students prefer going to a state that is nearer to his or her hometown. Others are comfortable to go anywhere, for them, this is not a concern. Courses offered: Check which streams are offered in engineering. 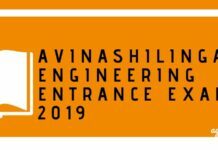 For example if you want to pursue Civil Engineering and that college is not providing civil engineering, then you should not apply for entrance exam for that college. An engineering entrance exam ranks students on basis of their performance in that exam. One or more colleges use result of an entrance exam. It is accepted by more reputed colleges.